18 inch Auto Scrubber Red Scrubbing Pads FREE! 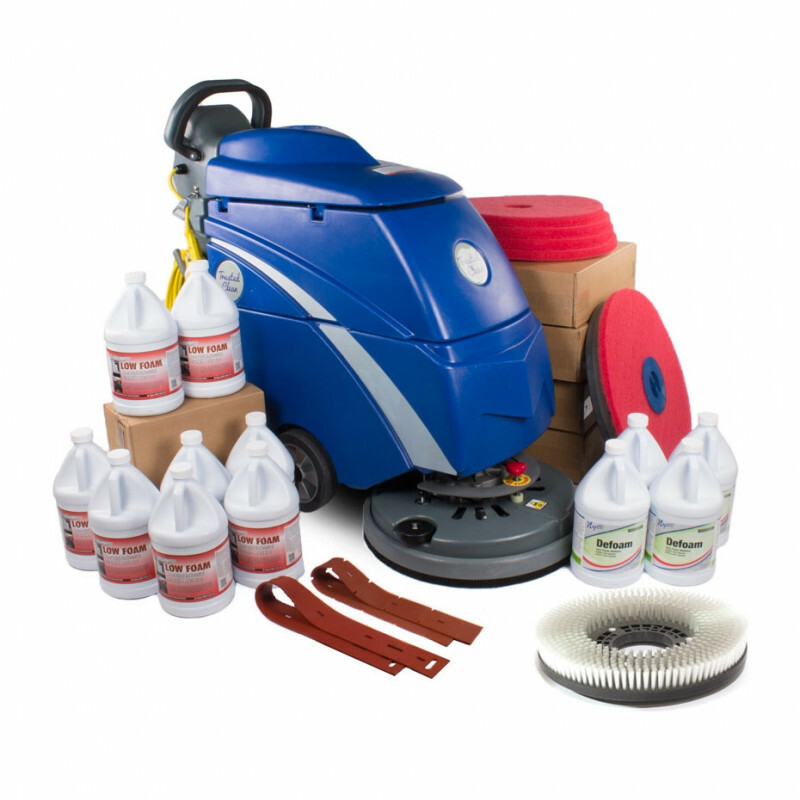 This automatic floor scrubber bundle comes packaged with every type of accessory, attachment and chemical you could possibly need to clean a floor. Good for uneven and rough floors, and great for smooth finished floors! This package starts and ends with the 'Dura 18HD', as it is the best valued auto scrubber in the industry today. Backed with a 5 year "No Questions Asked" warranty on non-wear items and motors, you can have confidence that this machine will be working for you in years to come. An 18 inch brush is included with the machine for general scrubbing on even or uneven floors. We also include a versatile pad driver. The pad driver allows you to use any 18 inch pad with your machine for more thorough cleaning on smooth floors. To get you started, we also included 25 red pads for FREE. These pads are great for light, everyday scrubbing on a smooth surface and will not harm your wax on your finished floor. The included scrubbing solution and defoamer are both basic solutions that will not harm any surface. A pair of extra replacement squeegees are also thrown in to the package so you are ready to swap them when the original pair wears down. The value of this package can't be beat! We have such confidence in the performance of this auto scrubber, we back it with a 5 Year "No Questions Asked" Warranty plan. This Trusted Clean 'Dura 18HD' comes with a brush & an 82' power cord. A brush is a universal cleaning tool that can be used on smooth or rough floors. With an 82' power cord, you have unlimited run time. This low foaming degreaser is great for use in auto scrubbers. Not only does it work great for cutting grease and oils from the floors you're cleaning, but it also a low foaming detergent, meaning it will help to prolong the life of the vacuum motors in your auto scrubber. With the use of this pad driver, your 'Dura 18HD' can now be equipped with any 18 inch pads. With the right kind of pad, this machine can be used for many different applications including scrubbing & stripping. This liquid defoamer is great for extending the life of your vacuum motor. It cuts down on the foam that is created when the solution is recovered from the floor. This front squeegee blade is slotted to allow solution through into the vacuum recovery chamber. The squeegee assembly follows directly behind the brush/pad to recover 100% of the scrubbed solution from the floor. Can be used on all 4 sides. This rear straight squeegee follows behind the slotted front squeegee to form a squeegee chamber for efficient recovery of scrubbed solutions. It essentially wipes the floor clean. Can be used on all 4 sides. Customers who were interested in the Trusted Clean 'Dura 18HD' Electric Auto Scrubber Bundle with Pads were also interested in the following items. Trusted Clean 'Dura 18HD' Electric Auto Scrubber Bundle with Pads was just what my business needed . Easy to maneuver, grate value , with in my budget. This is a great machine. Wr have a 2000 sq ft concrete shop floor, with epoxy finish. Dirt builds up and it needs to be scrubbed then power washed, then push out the door with a squeegee. NOW, this one,machine does all of that!! Couldnt be happier!!! Highly recommended for the value. No need to buy a name brand!! Customer Service rep was awesome explaining the products and getting us a bundle that fit our needs!! Thank you!! Received item in a very reasonable amount of time. Set aside several hours for unpacking and assembly. Took no time at all, very easy, was cleaning in no time. Machine works great for our commercial office space. Save a lot of time. I bought the Dura 18 HD when I started my cleaning business. I put it through quite the test right out of the gate. Got a contract to clean a factory floor that hadn't been cleaned in a year and a half. I used the degreaser that came with this package deal, and it worked flawlessly. The customer was blown away, and ended up requesting a weekly cleaning contract. This scrubber means business, and I highly recommend it to anyone who doesn't want to dish out 4 grand for a battery powered option. The cord is easy to manage thanks to the design of this machine. Couldn't be happier! We bought 2 of these packages for our 2 new auto shops. We will be buying more. The only complaints I have is having to deal with the cord all the time & the pad driver mount takes a little bit to get used to. You can't beat the price though. Would definitely recommend! This is a review for the Trusted Clean 'Dura 18HD' Electric Auto Scrubber Bundle with Pads.